The city’s Board of Estimates is set Wednesday to approve a $120,000 settlement with a North Baltimore woman who broke her right wrist after tripping on an uneven sidewalk three years ago. The city’s Board of Estimates is set to approve settlements Wednesday in two slip-and-fall cases totaling $125,000. 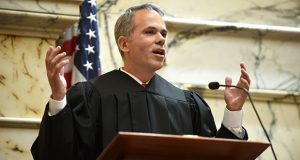 The agency that oversees the Washington-area Metro subway system cannot be sued for injuries caused by negligent maintenance of its passenger stations, Maryland’s top court held on Friday.